Much like the Japanese beef stew that gives the film its title, Takashi Miike’s “Sukiyaki Western Django” is a cinematic concoction chock-full of potentially tasty ingredients. Classic Hollywood westerns, Italian spaghetti westerns, Japanese chanbara films, and the “Eastern Westerns” released by Japan’s Nikkatsu studios in the 1950’s and ‘60s are but a few of the elements in this film’s stylistic DNA. The film’s title neatly reflects the triumvirate Japanese-American-Italian influences to be found within. Having it all refracted through the cockeyed vision of Miike, the prolific enfant terrible of contemporary Japanese cinema, promises a mind-blowing experience, at least on paper. The pre-credits sequence is indeed promising: Quentin Tarantino, Miike’s most famous fan, appears in an extended cameo as Piringo, a poncho-wearing gunslinger who tells the story of the centuries-long feud between the red-costumed Heike and the white-costumed Genji clans. The story is set, according to an on-screen title, “several hundred years after the Battle of Dannoura,” a major conflict between the two clans that occurred in 1185. Tarantino, clearly relishing every second of his onscreen time, relates his tale in an odd accent that sounds like Toshiro Mifune, Clint Eastwood and John Wayne rolled all into one. On a luridly artificial desert set complete with a painted sun and mountain, Piringo, after dispatching three gunslinger foes in a sequence clearly cribbed from the opening scene of Sergio Leone’s “Once Upon a Time in the West,” partakes of the titular dish with a baroque flourish. So far, so good. The film’s opening sequence not only sets up the premise, but also the visual style, colored with a lovingly burnished autumnal tone that bathes the widescreen image in a nicely rendered glow, a testament to the excellent work of veteran cinematographer Toyomichi Kurita. The sets by production designer Takashi Sasaki are also impressive, seamlessly melding the film’s fusion of influences. Also established at the outset is the style of dialogue. The film’s Japanese cast speaks not in their native tongue, but in heavily accented, phonetically spoken English that in most cases is very difficult to understand without the help of subtitles (which were, alas, not included in the preview screener I viewed). This poses a problem in navigating the complicated twists and turns that the story takes, making what is happening unintelligible much of the time. However, the fact that the film’s antecedents are so clear – it follows the basic trajectory of both Akira Kurosawa’s “Yojimbo” and Leone’s “A Fistful of Dollars” – helps to clarify things a little bit. And therein lies the film’s fatal weakness: we’ve really seen it all before. Once the novelty of its Asian-fusion milieu and its unusual verbal syntax wears off, the film proceeds to spin its wheels for two hours and doesn’t really take its premise anywhere. What prevents “Sukiyaki Western Django” from being the fun experience it really should be is its distinct air of calculation. Much too often, the film comes across as a self-conscious, midnight-movie feature aimed at the Ain’t It Cool News fanboy crowd. While there is much to admire, especially in the film’s visual scheme, in the end it becomes in a rather enervating experience. What made such films as “Yojimbo,” “A Fistful of Dollars,” Kurosawa’s “Seven Samurai,” John Sturges’ “The Magnificent Seven” and Sergio Corbucci’s seminal spaghetti Western Django (all cited on the film’s website as cinematic ancestors) enduring classics was that they stood alone as fully realized works; they were not specifically created as cult objects and occasions for “spot-the-influence” parlor games. The approach that Miike takes with his material – the accented English that seems to be an analogue to the dubbed English in Italian Westerns, as well as the direct cinematic references sprinkled throughout – unfortunately has the effect of lending everything an arch, distancing, sub-Brechtian air. That said, I should cite the film’s one major asset – which alone helps to redeem it and breathe needed life into this airless environment – is the great veteran actress Kaori Momoi. 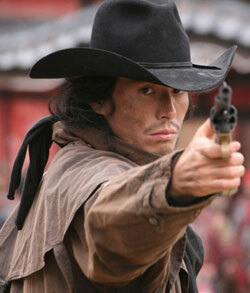 Playing a tough female gunslinger, Momoi is a mesmerizing presence that commands the screen whenever she appears. And she is clearly having fun, especially in the final showdown, handling guns as if she’s been doing it all her life. The only part of her performance that doesn’t work is an extended flashback sequence in which she is a willowy, submissive paramour to Tarantino, a role that doesn’t fit her at all. Still, when Momoi is on screen, she is a volcanic force that breaks through the film’s mannerist veneer. “Sukiyaki Western Django” screens at the Japan Society on July 5 as part of the New York Asian Film Festival and the Japan Cuts Festival of New Japanese Film. Tickets may be purchased online from the Japan Society.